TORONTO, Jan. 16, 2019 /PRNewswire/ - Golden Star Resources Ltd. (NYSE American: GSS; TSX: GSC; GSE: GSR) ("Golden Star" or the "Company") is pleased to announce its preliminary production results for the fourth quarter ("Q4") and full year ("FY") of 2018 and its guidance for FY 2019, as well as a change to its management team. "2018 marked the completion of the transition of our two operations into fully underground mines, focused on higher grade and higher margin production. This is a significant achievement and positions the company strongly for the future. We're confident that there is still much potential to be realized. At Wassa Underground, operational performance has consistently exceeded our expectations and at the same time the resource base has continued to grow, underpinning our confidence in its substantial production growth potential. For Prestea, 2018 was a difficult year with performance below our expectations in terms of production and costs. In the fourth quarter, we took a series of actions to ensure that the operation is rightsized with the appropriate skills base and cost structure to move towards consistently delivering a run rate of 650 tonnes per day ("tpd") during 2019. With a strong balance sheet, I am confident that all of the elements are in place for the Company to successfully deliver on its target of increased production at a lower cost, driving value for its shareholders." Golden Star produced 224,861 ounces of gold in 2018 on a consolidated basis. Going forward the Company is focused on developing its high-grade underground production profile, rather than the higher cost, lower grade, open pit supply that was mined in the past. Wassa Underground has already proven to be well on this path and continues to show improvements year over year. Prestea faced a number of challenges during 2018, however with the actions taken in the last quarter of the year, it is now well positioned to ramp-up to the targeted run rate of 650 tpd over the coming months. As illustrated by the graph, the transition from two open pit operations into two underground mines has now been achieved. As the Company heads through 2019, the cost improvements from this approach are expected to continue to be delivered at the same time as development capital spend is ramped up to enable Golden Star to achieve the longer-term potential of its assets. 2. Development capital are those costs incurred at new operations and costs related to major projects at existing operations where these projects will materially increase production. All other costs relating to existing operations are considered sustaining capital. Golden Star's 2019 consolidated production guidance is in line with actual production delivered in 2018, albeit the composition will be different. As a result of Wassa Underground continuing to surpass expectations, and capital being allocated to upgrade infrastructure and the additional delineation and stope definition drilling, Wassa's production guidance has been increased by 17% from the 2018 achieved production of 149,697 ounces of gold. In 2019, Wassa is expected to produce at an average rate of approximately 3,500 tpd moving towards a target of 4,000 tpd in 2020. Deep drilling has continued to show positive results and studies are ongoing to decide on the optimal long-term development of the asset, including the appropriate mining method. A Preliminary Economic Assessment is expected in the second half of 2019. 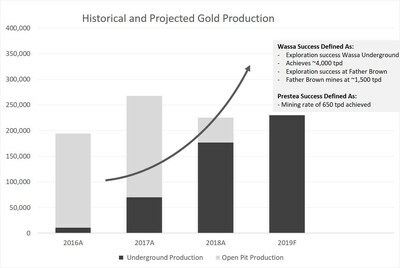 At Prestea, with the cessation of open pit mining and the ongoing ramp-up of underground volumes, guidance for 2019 has been set at 50,000-60,000 ounces of gold for the year. In the final quarter of 2018, the Company concluded the business rightsizing by reducing the workforce and establishing a lower direct operating cost base. During the fourth quarter of 2018 the plant was converted to a low tonnage, high grade configuration allowing it to efficiently treat the underground production. At the end of 2018, significant improvements were being recorded in Prestea's lead production indicators. Improvements in raise development, long hole drilling and blasting productivities are expected to continue to bring the production rate up to the 650 tpd target in 2019. At the beginning of January, one stope is in final drawdown and one stope is blasting/swell mucking. The raising, drilling and mining sequence is moving into a steady cycle which will facilitate the mucking of 650 tpd from final drawdown, swell mucking and raise ore sources. As a result of positive reconciliation from mineral resources to mined ore and excess processing plant capacity, in 2019 capital has been allocated to install infrastructure that is expected to achieve increased mining rates of 4,000 tpd in early 2020 at Wassa. This capital includes $18.1 million of development capital, which will be allocated to mobile equipment, paste backfill plant construction, electrical upgrades and improvements to the tailing facilities. Capital has also been allocated for delineation and stope definition drilling in order to potentially increase Proven Mineral Reserves. A budget of $13.4 million has been set for exploration activities in 2019, broken down to include $9.8 million at Wassa for both inferred resource expansion drilling and inferred to indicated conversion, with an initial $1.5 million dedicated to Father Brown for infill expansion drilling. At Prestea, $1.6 million has been allocated for expansion drilling. The remaining $0.5 million is earmarked for follow-up drilling to be defined when results are delivered. In 2019, drilling is focused on Father Brown and the Wassa Southern Extension in order to accelerate organic growth. The excess plant capacity available at the operations improves capital efficiency, therefore the Company expects a higher rate of return when developing these projects. At Prestea, the same optionality exists as throughput increases. The Company's Exploration strategy is to build on the existing resource base at Wassa and Prestea and to prove up significant tonnage and grade to advance Father Brown to the development stage. Golden Star is also pleased to announce that effective January 2, 2019 Tania Shaw has been appointed Vice President, Investor Relations and Corporate Affairs. Ms. Shaw is a seasoned investor relations professional and has held positions in communications and investor relations in the gold sector for the last 14 years. She was previously Vice President of Investor Relations for Oceanus Resources, and prior to that held roles of increasing responsibility with Detour Gold, Primero Mining and Roxgold. Ms. Shaw obtained her CPIR designation (Certified Professional Investor Relations) in 2013 and is a member in good standing of the Canadian Investor Relations Institute. Golden Star thanks Katharine Sutton for her contribution to the Company over the last two and a half years and wishes her well in her future endeavours. Golden Star is an established gold mining company that owns and operates the Wassa and Prestea underground mines in Ghana, West Africa. Listed on the NYSE American, the Toronto Stock Exchange and the Ghanaian Stock Exchange, Golden Star is focused on delivering strong margins and free cash flow from its two high-grade, low cost underground mines. Gold production guidance for 2019 is 220,000-240,000 ounces at a cash operating cost per ounce1 of $620-$680. As the winner of the PDAC 2018 Environmental and Social Responsibility Award, Golden Star is committed to leaving a positive and sustainable legacy in its areas of operation. In this press release, we use the terms "cash operating cost per ounce" and "All-In Sustaining Cost". These should be considered as non-GAAP financial measures as defined in applicable Canadian and United States securities laws and should not be considered in isolation or as a substitute for measures of performance prepared in accordance with GAAP. "Cash operating cost" for a period is equal to "cost of sales excluding depreciation and amortization" for the period less royalties, the cash component of metals inventory net realizable value adjustments and severance charges, and "cash operating cost per ounce" is that amount divided by the number of ounces of gold sold (excluding pre-commercial production ounces sold) during the period. We use cash operating cost per ounce as a key operating metric. We monitor this measure monthly, comparing each month's values to prior periods' values to detect trends that may indicate increases or decreases in operating efficiencies. We provide this measure to investors to allow them to also monitor operational efficiencies of the Company's mines. We calculate this measure for both individual operating units and on a consolidated basis. Since cash operating costs do not incorporate revenues, changes in working capital and non-operating cash costs, they are not necessarily indicative of operating profit or cash flow from operations as determined under IFRS. Changes in numerous factors including, but not limited to, mining rates, milling rates, ore grade, gold recovery, costs of labor, consumables and mine site general and administrative activities can cause these measures to increase or decrease. We believe that these measures are similar to the measures of other gold mining companies, but may not be comparable to similarly titled measures in every instance. "All-In Sustaining Costs" commences with cash operating costs and then adds metals net realizable value adjustment, royalties, sustaining capital expenditures, corporate general and administrative costs (excluding share-based compensation expenses), and accretion of rehabilitation provision. "All-in sustaining costs per ounce" is that amount divided by the number of ounces of gold sold during the period. This measure seeks to represent the total costs of producing gold from current operations, and therefore it does not include capital expenditures attributable to projects or mine expansions, exploration and evaluation costs attributable to growth projects, income tax payments, interest costs or dividend payments. Consequently, this measure is not representative of all of the Company's cash expenditures. In addition, the calculation of all-in sustaining costs does not include depreciation expense as it does not reflect the impact of expenditures incurred in prior periods. Therefore, it is not indicative of the Company's overall profitability. Changes in numerous factors including, but not limited to, the Company's share price, risk free interest rates, gold prices, mining rates, milling rates, ore grade, gold recovery, costs of labor, consumables and mine site general and administrative activities can cause these measures to increase or decrease. The Company believes that these measures are similar to the measures of other gold mining companies, but may not be comparable to similarly titled measures in every instance. This press release contains "forward looking information" within the meaning of applicable Canadian securities laws and "forward-looking statements" within the meaning of the United States Private Securities Litigation Reform Act of 1995, concerning the business, operations and financial performance and condition of Golden Star. Generally, forward-looking information and statements can be identified by the use of forward-looking terminology such as "plans", "expects", "is expected", "budget", "scheduled", "estimates", "forecasts", "intends", "anticipates", "believes" or variations of such words and phrases (including negative or grammatical variations) or statements that certain actions, events or results "may", "could", "would", "might" or "will be taken", "occur" or "be achieved" or the negative connotation thereof. Forward-looking information and statements in this press release include, but are not limited to, information or statements with respect to: the ability of Golden Star to fund its capital expenditures program; 2019 guidance in terms of gold production, cash operating cost per ounce, All-In Sustaining Cost per ounce and capital expenditures; the potential of the Company to increase production at a lower cost and drive shareholder value, including production growth at Wassa and the ability to deliver a consistent run rate at Prestea; the Company's ability to achieve the long-term potential of its assets; the ability of Golden Star to increase the mine lives of its operations through exploration and to find additional sources of high margin ore; the targeted mining rate for Wassa Underground in 2019; the amount and grade of ore to be fed to processing plants in 2019; the targeted mining rate from Prestea Underground in 2019; the Company's ability to achieve strong organic growth and to add supply in order to utilize its excess capacity, including filling the Wassa processing facility with high-grade underground ore and achieving production of 650 tpd at the Prestea processing plant; the potential to increase gold production; the Company's ability to develop long-term margin focused mines; the achievement of a higher rate of return at the Company's projects, including by way of increased throughput; planned drilling at Father Brown and the Wassa Southern Extension during 2019; the achievement of approximately 3,500 tpd at Wassa in 2019; the ability to optimize Wassa in the future; 2019 capital spending at Wassa to install infrastructure resulting in the achievement of increased mining rates to 4,000 tpd; the ability of the Company to increase Proven Mineral Reserves at Wassa; the continuation of drilling at Father Brown; the advancement of Father Brown to the development stage; continued improvement in lead indicators at Prestea; and the timing for a Preliminary Economic Assessment at Wassa. Forward-looking information and statements are made based upon certain assumptions and other important factors that, if untrue, could cause the actual results, performances or achievements of Golden Star to be materially different from future results, performances or achievements expressed or implied by such statements. Such statements and information are based on numerous assumptions regarding present and future business strategies and the environment in which Golden Star will operate in the future, including the price of gold, anticipated costs and ability to achieve goals. Forward-looking information and statements are subject to known and unknown risks, uncertainties and other important factors that may cause the actual results, performance or achievements of Golden Star to be materially different from those expressed or implied by such forward-looking information and statements, including but not limited to: risks related to international operations, including economic and political instability in foreign jurisdictions in which Golden Star operates; risks related to current global financial conditions; risks related to joint venture operations; actual results of current exploration activities; environmental risks; future prices of gold; possible variations in Mineral Reserves, grade or recovery rates; mine development and operating risks; accidents, labor disputes and other risks of the mining industry; delays in obtaining governmental approvals or financing or in the completion of development or construction activities; and risks related to indebtedness and the service of such indebtedness. Although Golden Star has attempted to identify important factors that could cause actual results to differ materially from those contained in forward-looking information and statements, there may be other factors that cause results not to be as anticipated, estimated or intended. There can be no assurance that such statements will prove to be accurate, as actual results and future events could differ materially from those anticipated in such statements. Accordingly, readers should not place undue reliance on forward-looking information and statements. Forward-looking information and statements are made as of the date hereof and accordingly are subject to change after such date. Forward-looking information and statements are provided for the purpose of providing information about management's current expectations and plans and allowing investors and others to get a better understanding of the Company's operating environment. Golden Star does not undertake to update any forward-looking information or forward-looking statements that are included in this news release except in accordance with applicable securities laws. The technical contents of this press release have been reviewed and approved by Dr. Martin Raffield, P. Eng., a Qualified Person pursuant to National Instrument 43-101 Standards of Disclosure for Mineral Projects. Dr. Raffield is Senior Vice President of Project Development and Technical Services for Golden Star.